Notes: Felt pretty good this morning though I woke up early again. Went to my doc and go some ART, then came home and hit this workout on my Airdyne in may garage (usually use the one at the gym which is a bit newer). My Airdyne doesn't have watts, so I used RPMs instead to track my cadence during the intervals. The calorie count is probably a little different as well, so it would be hard to compare this week and last week on that basis. However, the recovery times were a little bit longer this week, with my heart rate was higher on average than last week (maxed out at 180 on a few sets). Didn't really feel lactic on any of these sets so I didn't pay it mind. What I did focus on was trying to get my heart rate back down as quickly as possible. 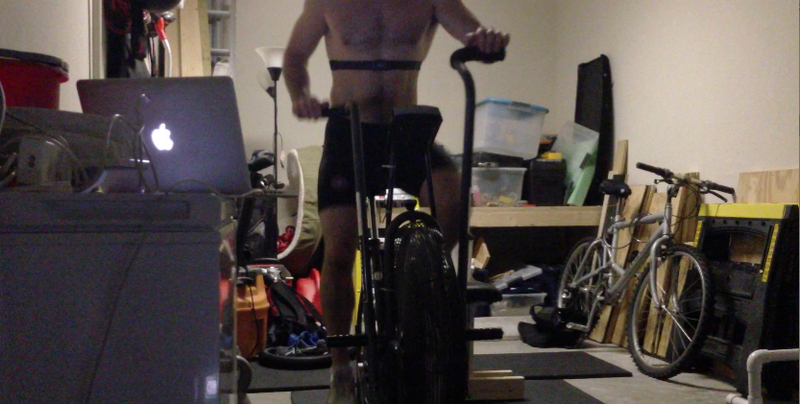 On a few sets I stood around, while others I sat on the Airdyne and focused on "breathing"my heart rate back down. Good effort today.